Inspired by last Friday’s professional development where we focused on students making observations, asking questions, and constructing explanations for phenomena; I wanted to provide my AP Physics 2 students with some practice in this area. We started with a computational model of two gases in the same container. One gas initially has a higher temperature than the other and is positioned on one side of the container. 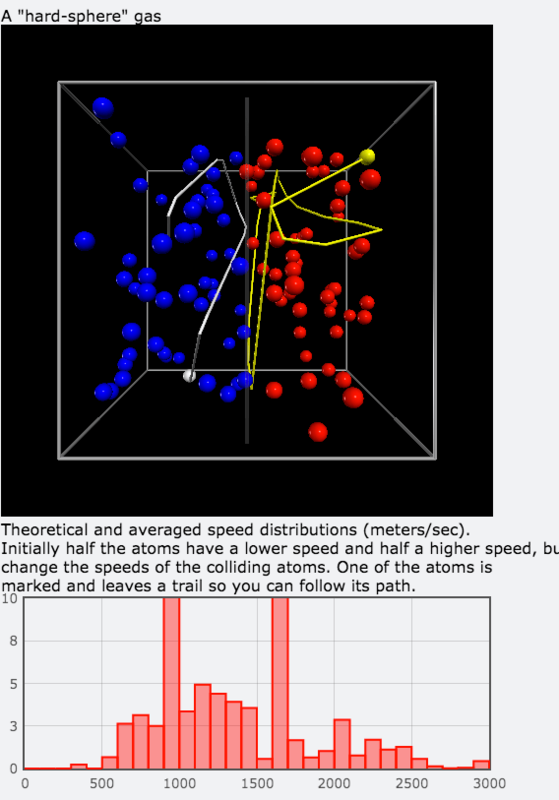 As the model runs, students can observe the interactions among the atoms of the two gases and the resulting histogram of rms velocity. Students made observations in groups, defined additional questions to investigate, and changed the parameters of the model accordingly. After plenty of time to investigate and discuss as a group, students individually wrote their own explanation of the phenomenon in the span of five minutes. Each group than read their explanations to each other, provided feedback, made revisions, and selected one explanation to share with the entire class. Each group than shared their selected explanation with the entire class and the entire class, including me, provided feedback. If students didn’t comment on their own, I took the opportunity to highlight explanations that cited our existing models as evidence, explained the phenomenon from both a macroscopic and atomic perspectives, and correctly used the vocabulary we have been practicing in our study of thermodynamics. After this discussion, student then looked at a modified computational model where the two gases are separated by a barrier that prevents each gas from crossing to the other side of the container but allows collisions between atoms across the barrier. We didn’t have time to go through the entire observations, additional investigations, and explanations cycle again, but students did connect this model to heat transfer via conduction.